This month I’d like to discuss the healing properties of Shiitake mushrooms and how our food really should be our medicine. I have always loved the idea that what we eat should also give us many health benefits and increase our vitality and stimulate us to grow in health, rather than weaken our bodies and start the road of disease that the S.A.D. (standard American diet) produces. 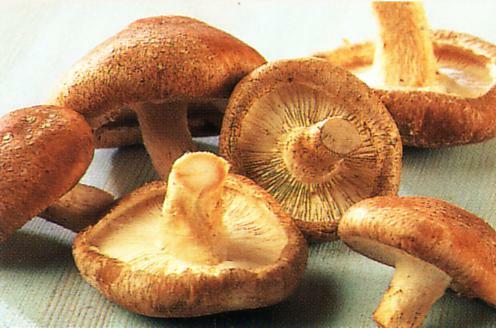 Shiitake Mushrooms have been used medicinally and eaten for thousands of years. Being a native of Japan, China, and Korea, Shitakes have a rich history in these culture’s and because of their ability to be preserved by drying, have been used throughout the whole year and have become a staple in the Asian cuisine. 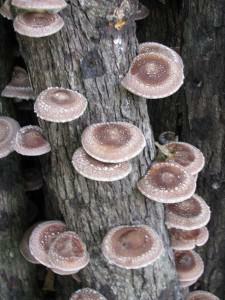 Shiitakes (Lentinula edodes) grow on fallen Oak tree logs. Oak trees have a very dense wood structure and great strength, a stately tree with powerful astringent properties that tone and contract weak tissues in the body. It stands to reason that any edible life form deriving its life off of an Oak would be a very powerful medicine as well as food. Shii is a Japanese word which refers to the type of oak tree they grow on, and take means the fruit of the mushroom. The fruiting mushrooms release spores that settle on other logs where the Mycelium wait for environmental conditions to change just right so they can emerge. 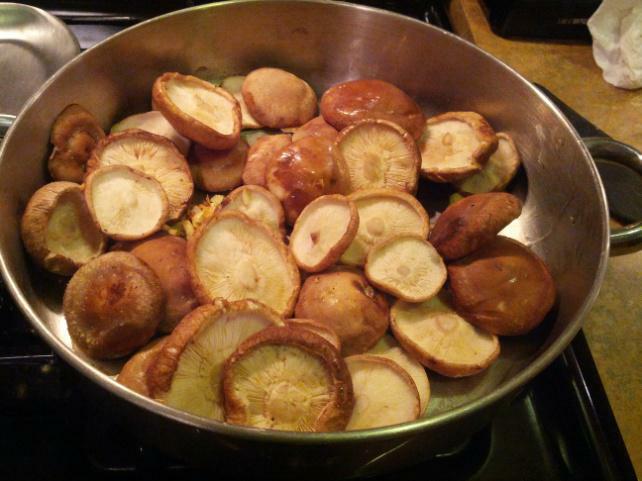 Time to harvest is very short, as it does not take long for them to develop into thick, fleshy caps to enjoy at mealtime. An interesting point about eating mushrooms is that they need to be cooked or extracted by a strong solvent like alcohol for the nutrients to be released from the dense woody structure and be available for the body to assimilate. 1. Combine oil and garlic in saute pan. Heat until oil is hot and garlic starts to sizzle, about 30 seconds. Do not let garlic brown. 2. Add mushrooms and sauté 6 to 7 minutes, turning until lightly browned. Season to taste with salt and pepper, sprinkle with parsley and serve. 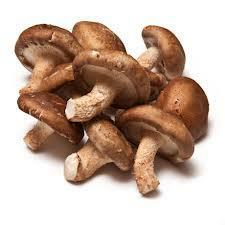 *This can be added to rice and veggies, sandwiches or any dish you would like the healing power of Shiitakes in. LET YOUR FOOD BE YOUR MEDICINE. YO. 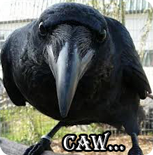 Be sure to check out next month’s Crows corner for more….Caw caw.